How Many Types of Italian Pasta Can There Really Be? When you think of italian food, pasta probably comes to mind. You probably know the basic types of pasta you can find being served at any Henderson Restaurant that serves italian food; spaghetti, linguine, and fettuccine being among the most commonly known varieties. But what about those not so well known varieties? Keep reading to find out more about a few of the uncommon types of italian pasta that you may not have tried. Also known as perciatelli, this pasta is most commonly used recipes like pasta all’amatriciana, with robust flavors like cured pork, tomato and spices, it’s name derives from the italian word “buco” meaning hole, while its neapolitan variant “bucato” means pierced. This aptly named pasta is a long tube, much like cross between spaghetti and macaroni. It is a thick pasta with a hole running down the center of the noodle that is great for soaking up the flavor of italian herb infused tomato sauce. Taking its name from the italian word for corkscrew, this tight, spiral shaped pasta locks in flavors, and pairs well with both simple and sophisticated sauces. Cavatappi is commonly served with meat sauces, as well as in seafood dishes with herbs and cheese. It is also commonly prepared with leaf vegetables, as well as beans and other lean proteins. These spiral shapes are great when used in pasta salads, and can add a touch of fun to your boring old neighborhood potluck. Commonly known as pasta shells, this pasta takes its name from the italian word for conch, a common name that is applied to a number of different medium to large-sized shell-dwelling sea creatures. Available in in small, medium and large varieties, this pasta is commonly served with some form of cheese. The smaller varieties are commonly used as a substitute for macaroni, while the larger varieties are sometimes served stuffed with mixtures of cheese, herbs, chopped spinach and other leaf vegetables, often topped with marinara sauce. 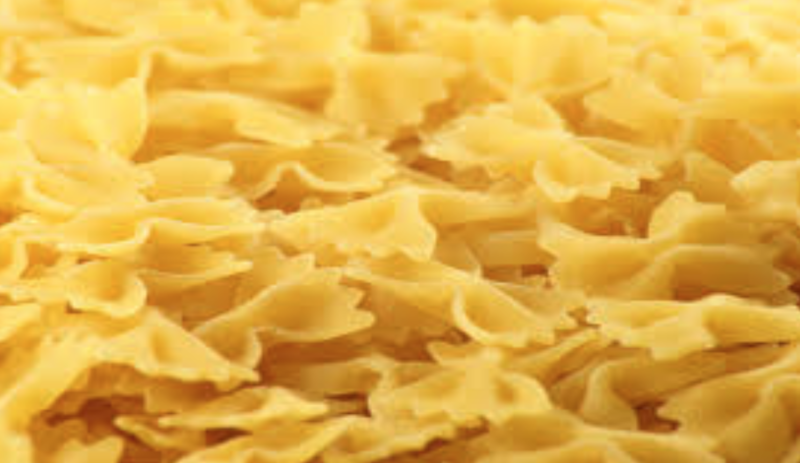 Commonly known as “bowtie pasta,” this unique pasta derives its name from the word “faralla”, the italian word for butterfly. While common plain and whole grain varieties are widely enjoyed by the masses, some varieties also incorporate different pigment rich vegetables such as beetroot and spinach, as well as ink from the cuttlefish, a relative of squid and octopi. These additives not only affect the color of the pasta, but also the flavor, making farfalle a versatile and unique type of noodle. These festive looking noodles can add a bit a fun and flair as a substitute for macaroni or penne. Fideo noodles are short, thin, and curved. 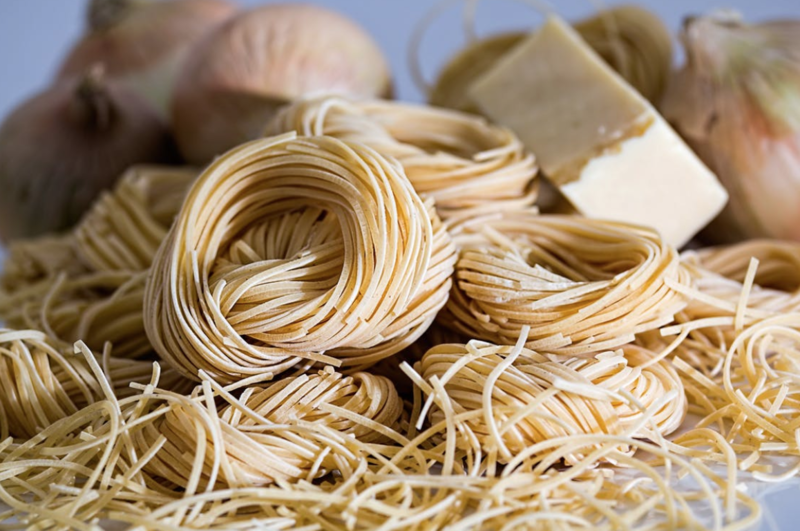 Fideo pasta is commonly partnered with veggies and lean proteins to be used in various soup recipes. Pronounced “nyawk-kee”, these are dumpling style noodles very similar in taste and texture to the doughy potato dumplings known as “kluski leniwe”, or “lazy noodles” in slavic homestyle cuisine. The word gnocchi may be derived from the Italian word “nocchio”, meaning a knot in wood, or from “nocca”, meaning knuckle. However, the exact origin of it’s name is unclear. Commonly made with ingredients like potato, cheese, egg, and even the addition of spinach, this ancient foodstuff dates back to the times of the roman empire, and is a hearty meal that was commonly eaten by soldiers preparing for battle. This flat wide ribbon pasta is similar in shape to the lasagna noodle but slightly narrower in size. The pasta comes in both short and long lengths and is a versatile pasta that can be paired with almost any type of sauce or cheese. The only limitations to preparing this pasta are creativity and culinary skill. Tortelloni and tortellini are varieties of stuffed pasta. Taking their names and appearance from the italian word for turtle, the main difference between these two pastas is a matter of size. Typically a single tortelloni will weigh about 5g as opposed to 2g for tortellini. Although either can be filled with a wide variety of foods, meat-based filling is less common in tortelloni however, with recipes commonly including pumpkin, chopped spinach, and cheese. These pastas are commonly served in broth, with herb infused butter, or sometimes with ragu, a thick, meat based sauce common in regional cuisine of Tuscany. Tagliatelle is a long, ribbon like pasta very similar to fettuccine. However, the former variety is about twice as wide and a bit thicker than the latter. It can be served with an array of sauces but a classic meat sauce tends to be the standard in most recipes. There are so many different and unique types of italian pasta, each with its own history and origins, but one thing is for sure, pasta is a simple and delicious ingredient that has been enjoyed in some form, all over the world. We’ve just scratched the surface of this subject, and there are many other types of pasta that are not included on this list. What are your favorite kinds of italian pasta? What kind of sauce or other ingredients do you like to pair it with? Leave us a comment with your best pasta recipe in the section below.